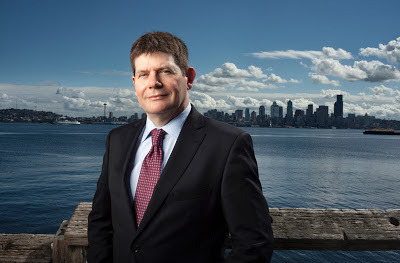 Today Seattle Opera announced that Aidan Lang will succeed Speight Jenkins as General Director. Respected in the world of opera for leadership positions with New Zealand Opera, Glyndebourne Opera Festival, the Buxton Festival and Opera Zuid, Lang will join Seattle Opera full-time in March 2014, and will then become the company’s third General Director when Speight Jenkins steps down on September 1, 2014. Since 2006, Lang has served as General Director of New Zealand Opera, with a goal of ensuring that every production is theatrically stimulating and musically ambitious. Working collaboratively is a top priority for Lang, and during his tenure New Zealand Opera implemented a series of collaborations with such companies as Glyndebourne, Opera North, and Welsh National Opera, bringing exciting productions from directors Nikolaus Lehnhoff (Jenůfa) Tim Albery (Macbeth) and Christopher Alden (Turandot) to New Zealand. In addition to bringing productions in, Lang made it a priority to develop the capacity to build productions in the country, establishing New Zealand’s first ever opera production workshop. This achievement has resulted in international co-productions with Scottish Opera (L’italiana in Algeri), Victorian Opera (Serse), and this year’s Der Fliegende Holländer with Opera Queensland in Australia. Future international co-productions are also underway with Cape Town Opera, West Australian Opera, Opera Queensland, State Opera of South Australia and Victorian Opera. Lang’s collaborative approach has also reaped significant rewards in the business area. With the expansion of the company’s reach to include Christchurch, in addition to its performing centers in Auckland and Wellington, Lang has rebranded New Zealand Opera as a truly national company, one that serves the entire country. The Company’s success over the past few years has been noticed, and the partnership Lang spearheaded with Creative New Zealand (the country’s national arts development agency) resulted in significant increases to its core grant funding, securing long-term financial stability for the company. Prior to leading New Zealand Opera, Aidan Lang held artistic leadership positions at Buxton Festival, Glyndebourne Festival Opera, Glyndebourne Touring Opera and Opera Zuid in the Netherlands. Concurrent with these leadership positions, Lang was a sought-after freelance director working around the world. Among other productions, he directed the first Brazilian production of Wagner’s Ring at the historic Teatro Amazonas in Manaus. Other noted productions include Le Comte Ory (Welsh National Opera), Monteverdi’s Il ritorno d’Ulisse in patria (Lisbon), The Turn of the Screw (Salzburg) and the British premieres of The Magic Fountain by Frederick Delius (Scottish Opera) and Cornet Christoph Rolke’s Song of Love and Death by Siegfried Matthus (Glyndebourne). As Artistic Director of the Buxton Festival, Lang expanded the Festival to include Baroque and contemporary music, tripled its audience attendance and delivered significant operating surpluses in each year. He was a key part of the triumvirate senior management team at Glyndebourne, where he held dual positions for nine years; he succeeded in developing a unique identity for Glyndebourne Touring Opera, distinct from the larger Glyndebourne Festival, and continuing the company’s tradition of nurturing young singers. Concurrent with his positions at Glyndebourne, he was appointed the inaugural Artistic Director of Opera Zuid, a newly-created touring company based in the Netherlands. During his leadership, Opera Zuid’s impact and the quality of its work were such that the company received national funding and is now a permanent fixture of operatic life in the Netherlands. Born in 1957 in the UK, Lang is a graduate of The Tiffin School and the University of Birmingham. He will relocate to Seattle with his wife of 23 years, the former soprano Linda Kitchen, and their 16 year old daughter Eleanor. In addition to his operatic leadership skills and international directing experience, Lang is an accomplished musician, having studied clarinet since the age of 8. The Brazil "Ring" and indications of fund-raising potential (broad perspective, business-friendly)gives me hope that we have a winner! Of course, no one will ever replace Speight in our hearts. How eerily Ironic, I was at the Seattle Opera not long ago, and am headed to the New Zealand Opera early next year. I'd say that is more than a coincidence!